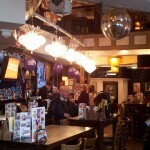 Even purple balloons don’t improve this place. Growing up in York, Rich remembers that the cops simply used to sit outside the local Yates because they knew that sooner or later a fight would break out. I don’t know if that ever happens at this location — we visited on a weekday afternoon for lunch when it was pretty mellow. The clientèle was somewhat varied, and it’s definitely in a convenient location for anyone heading to or from the station. 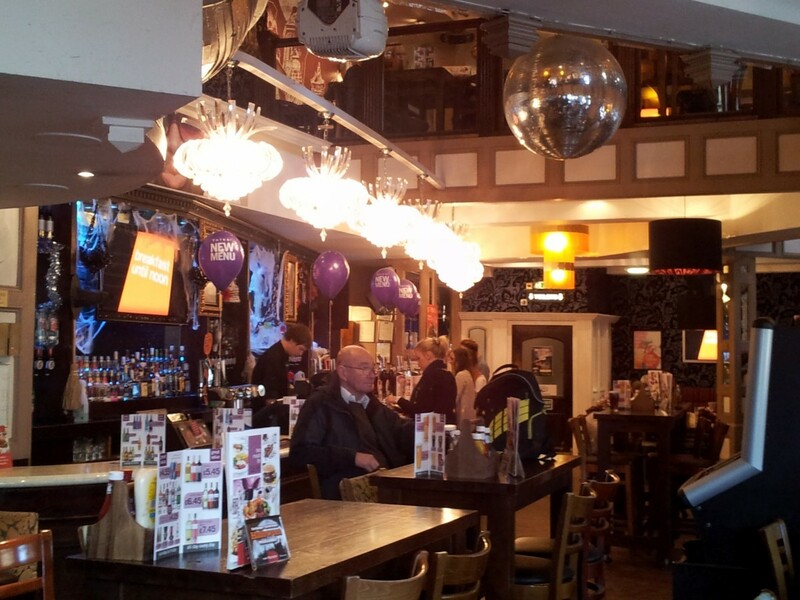 But if I had to describe the Boar Lane Yates’s in one word, it would be grim. Though it appears to have been recently redecorated, its seats, tables, floors, cushions — pretty much everything — are covered with one kind of grime or another. Even the drinks menu on our table had a big dirty footprint on it. The place is full of tacky chandeliers and a giant disco ball, and even two poles to dance around should the mood strike you. The good news is it’s very large, with a full upstairs and plenty of seating. The bad news is that means just more sticky surfaces. This photo actually paints the tackiness in quite a positive light. The beverage selection is equally depressing: trashy alcopops, cheap mass-produced lagers, and cocktails covering the entire colour wheel (blue and purple being favourites). They do offer two cask ales (Leeds Pale and Wells Bombardier), which are the only saving graces, as we found nothing in the refrigerators to tempt us. And while they do serve reasonably priced food and breakfast, the quality is far from remarkable; definitely a get-what-you-pay-for situation. So if you’re looking for a place that prides itself on the number of different Red Bull varieties it has behind the bar, definitely duck in. Otherwise, you probably want to move up the hill of New Station Street for something more promising. Visited Tuesday lunch 6/5/2014 with two of my sisters…..ordered chicken combo sharer….oh dear !!! The chicken wings were slimy …, the kebab tasted like last weeks…the mini fillets were edible just !!! The other dish gammon with egg and pineapple wasn’t much better ….the gammon being tough, dry and tasted like it had been cooked the day before, chips cold and soggy. A very disappointing experience of which the waitress said she would pass onto the chef…..needless to say I wont be visiting again!! A total waste of money !!!!!!!!! 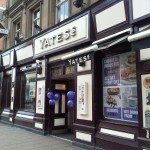 Much better places to eat in Leeds ……beware Yates !!!! Still, you have to say it’s quite an achievement to be so consistently, relentlessly bad everywhere in the country. This gets 1 star for the ale options and a bonus half a star for the public service it offers. Lots of the individuals you really wouldn’t want to be in the same room as love Yates’. 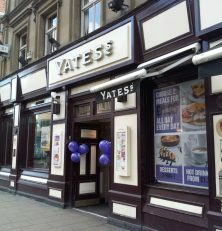 Thank You Yates. I went in here recently before catching a train for a pint and a cheap bite to eat. 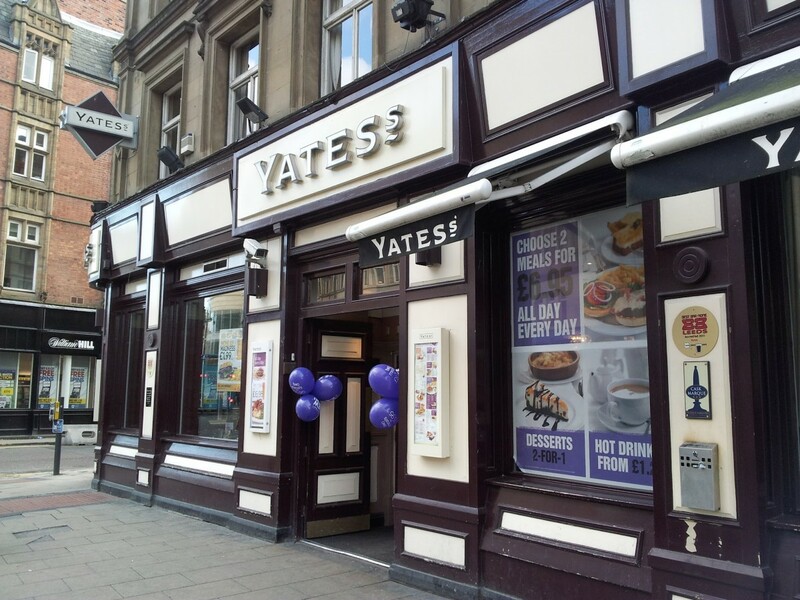 Its a few years since I had been in a Yates and little has changed except this one seemed particularly tired. Tables were a bit grimy, as was the carpet. There only seemed to be two staff on to cover the bar and delivering food. The beer choice is limited but the food was adequate and decent value. The atmosphere was pleasant enough but you get the feeling everyone is paying a flying visit.